Our Michigan road defect lawyers handle cases for clients injured due to a defective highway, roadway, street, or sidewalk. The Michigan winter months can be particularly devestating to roads and walkways, and often times these defects are not fixed in a timely manner. Large cracks and potholes can wreck havok on unsuspecting motorists. Serious injuries are often caused by hazardous roads. These dangerous areas can cause dangerous car accidents and motorcycle accidents. Pedestrians are often injured due to raised sidewalks, uneven walkways, and potholes. Our experienced personal injury lawyers file cases against the State of Michigan, counties, cities, townships, and muncipalities where people suffer harm due to a dangerous road or sidewalk. It is essential that the governmental agency responsible for maintaining the location of the injury be properly identified in order to pursue a case. These cases can result in sigificant settlements and money compensation for the injury victim. Bicyclists and motorcyclists often suffer the most severe injuries in these dangerous road accidents. This is especially true for potholes in the roadways and defective highway shoulders, including dangerous shoulder drop offs. Cases involving fatal accidents can give rise to a wrongful death lawsuit. It is essential that pictures and video, if possible, be taken of dangerous and defective conditions on highways and sidewalks. This is the best way for our Michigan road defect lawyers to prove that the condition was hazardous in your case. If the area is repaired before pictures are taken, it can be difficult to prove how dangerous the condition was on the day you were injured. However, the repairs may be used as evidence that the hazardous condition was in need of repairs. It is also important that measures be taken of a pothole, raised cement, or other type of dangerous condition. While photographs provide great evidence of a road defect, the actual measurements of the condition are often what is necessary to prove and win a case. Our legal team and investigators will go to the location and take accurate measurements of the condition, but it is essentially that you contact us as soon as possible after the incident so measurements can be taken before repairs are made to it. 691.1404 Notice of injury and defect in highway. (1) As a condition to any recovery for injuries sustained by reason of any defective highway, the injured person, within 120 days from the time the injury occurred, except as otherwise provided in subsection (3) shall serve a notice on the governmental agency of the occurrence of the injury and the defect. The notice shall specify the exact location and nature of the defect, the injury sustained and the names of the witnesses known at the time by the claimant. (2) The notice may be served upon any individual, either personally, or by certified mail, return receipt requested, who may lawfully be served with civil process directed against the governmental agency, anything to the contrary in the charter of any municipal corporation notwithstanding. In case of the state, such notice shall be filed in triplicate with the clerk of the court of claims. Filing of such notice shall constitute compliance with section 6431 of Act No. 236 of the Public Acts of 1961, being section 600.6431 of the Compiled Laws of 1948, requiring the filing of notice of intention to file a claim against the state. If required by the legislative body or chief administrative officer of the responsible governmental agency, the claimant shall appear to testify, if he is physically able to do so, and shall produce his witnesses before the legislative body, a committee thereof, or the chief administrative officer, or his deputy, or a legal officer of the governmental agency as directed by the legislative body or chief administrative officer of the responsible governmental agency, for examination under oath as to the claim, the amount thereof, and the extent of the injury. (3) If the injured person is under the age of 18 years at the time the injury occurred, he shall serve the notice required by subsection (1) not more than 180 days from the time the injury occurred, which notice may be filed by a parent, attorney, next friend or legally appointed guardian. If the injured person is physically or mentally incapable of giving notice, he shall serve the notice required by subsection (1) not more than 180 days after the termination of the disability. In all civil actions in which the physical or mental capability of the person is in dispute, that issue shall be determined by the trier of the facts. The provisions of this subsection shall apply to all charter provisions, statutes and ordinances which require written notices to counties or municipal corporations. The failure to provide this statutory notice may cause dismissal of your case. Recent court cases have dismissed road defect lawsuits because the injured person either gave no written notice or insufficient notice to the department. Therefore, any person injured due to defective roadway should call our law firm immediately to start working on your case. Our Michigan road defect lawyers will represent you in your Michigan road, sidewalk, or highway defect injury case under our NO FEE PROMISE. This means that you will not be charged any legal fees whatsoever unless we obtain a settlement or recovery for you. You have absolutely no obligation for legal fees unless we win your case. If we do not obtain a settlement for you, you owe us nothing! To start your case now, contact the road defect attorneys at our Michigan law firm. We will start working on your case immediately and do everything necessary to win your case. Call now at (800) 606-1717 for your free, no obligation case review. Mr. Buckfire has devoted is legal career to helping the most vulnerable members of society, children and the elderly. He specializes in child lead paint poisoning, wrongful death, nursing home neglect, medical malpractice, and other serious injury cases. Daniel L. Buckfire specializes in Michigan car accident cases, no-fault insurance claims, dram shop liability, and general negligence cases. His adept knowledge of these areas of law have resulted in numerous significant settlements and verdicts on behalf of his injured clients. Robert spent the first years of his legal career as a defense attorney for insurance companies. He was named a Partner at a preeminent insurance defense firm before joining Buckfire & Buckfire, P.C. and he has a successful track record of significant trial verdicts. Randy has obtained millions of dollars in verdicts and settlements for his injured clients. He specializes in medical malpractice, birth injuries, nursing home negligence, wrongful death, and automobile negligence cases. Prior to joining Buckfire & Buckfire, Dondi worked for 11 years as a trial attorney for the Law Offices of Lawrence S. Katkowsky, P.C., which specialized in motorcycle accidents. A third-generation trial attorney, Moss joined Buckfire & Buckfire, P.C. in 2017 and brings over 25-plus years of extensive legal experience. Moss is an experienced trial attorney, representing those who have been injured as a result of all types of accidents. Prior to joining Buckfire & Buckfire, P.C., Nicolas served as a partner at a preeminent insurance defense law firm with a focus on defense litigation in catastrophic first-party automobile claims, third-party auto negligence, personal injury, premises liability and general negligence. ?Who is best attorney in Michigan for a defective road accident lawsuit? ?Can I sue the city if I fell on an uneven sidewalk and was injured in Michigan? 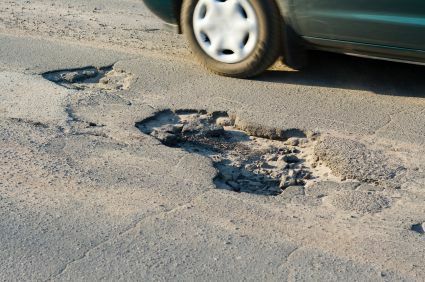 ?Can I sue the State of Michigan if I am injured in a car accident due to a pothole or other defective condition on a state highway for my injuries?